Let Jesus enlighten you between the Darkness with this awesome Fist of Jesus T-Shirt. The Fist of Jesus name and the Fish Thorns glows in the dark. Includes private links to the short film in HD, all the other Jesus adventures, the soundtrack and the digital Artbook. 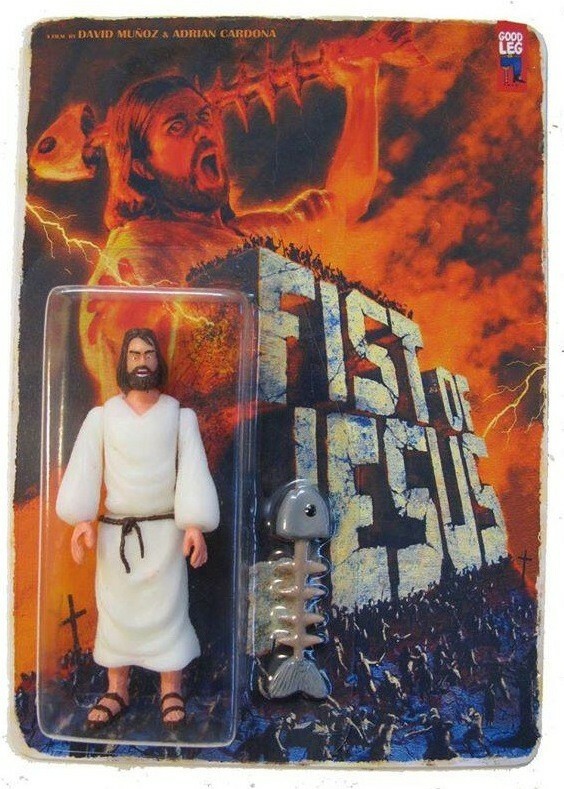 Deja que Jesús te ilumine en las tinieblas con esta milagrosa camiseta de Fist of Jesus. El título y la raspa de Jesús brillan en la oscuridad. 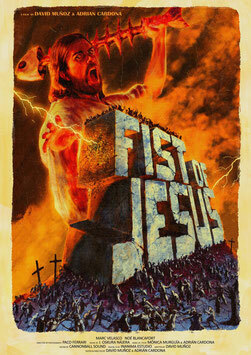 "Jesus Crasht" t-shirt Fist of Jesus with "Garbage Pail Kids" Style special edition + Fist of Jesus digital short film in HD 1080p + 45 digital illustrations and lobby cards + Original Soundtrack OST + FIST OF JESUS DVD. The 2 DVDs (185 minutes) in a pack with all the stickers, cards, the Fist of Jesus digital soundtrack, the digital art book, the HD short film and all the digital posters. Los 2 DVDs (185 minutos) en un pack que incluye las pegatinas, las descargas de la banda sonora, la colección de posters, el art book en pdf y el corto en HD de Fist of Jesus. 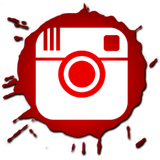 DVD description: Fist of Jesus Short Film + 5 New Jesus & Judas Adventures + Bloopers + Deleted Scenes + Making of + Soundtrack + 500 Photo Gallery + Once Upon A Time in Jerusalem Teaser + Sitges Premiere + Videogame Trailer + Brutal Relax Short Film and many other video extras. TOTAL RUNING TIME: 80 MINUTES. 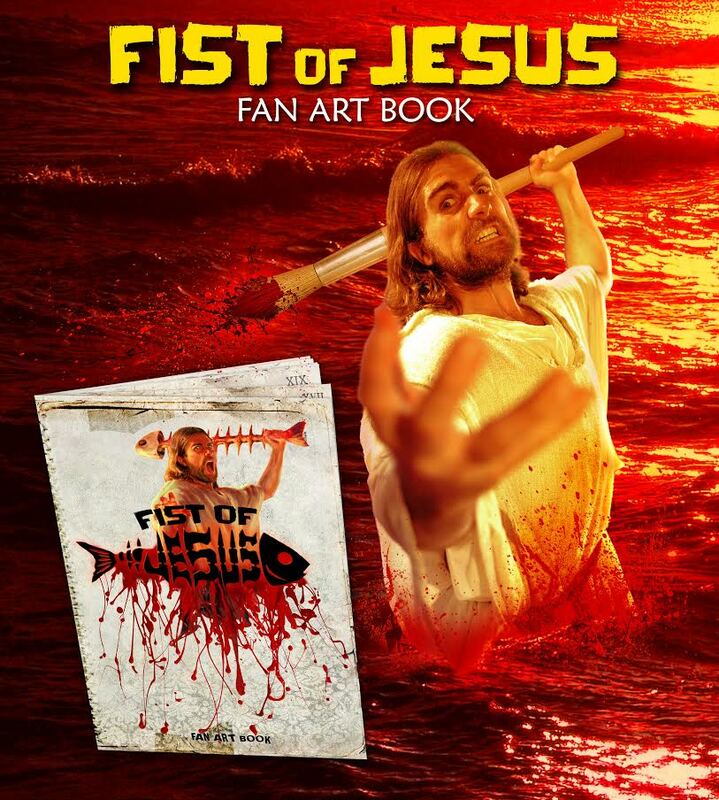 DVD description: 22 Short films including Fist of Jesus and Brutal Relax . Synopsis: Accountants in space, guys who spew coins, executives with mental powers, people disintegrating, entrepreneurs who find their perverse double in the toilet, depressed superheroes, children awoken by hungry monsters, a system to travel around the world without paying, just doing strange postures, ads to become dog food, a wanker alien and various adventures about office workers in danger is what you will find on this DVD. TOTAL RUNING TIME: 134 MINUTES. DIGITAL DOWNLOAD Own the most epic Jesus film EVER! Full HD 1080p download of the short film “Fist of Jesus” Runtime: 30 minutes, including 5 new Jesus short films in HD, the Feature Film teaser, the complete 9 songs from the original soundtrack and the most bloody sacred art book from the history with 36 pages full color and a poster gallery. DESCARGA DIGITAL Disfruta en Alta Definición de la película de Jesús más épica jamás rodada. Duración total: 30 minutos, con 5 nuevos episodios, el art book más sangriento y blasfemo de la historia con 36 paginas a color, los 9 temas de la B.S.O. y una galería de pósters. Bless your fridge with THE NEW FIST OF JESUS "GARBAGE PAIL KIDS" tribute magnet. The character is "JESUSITO MILAGRITOS" in Spanish it means JESUS LITTLE MIRACLE. 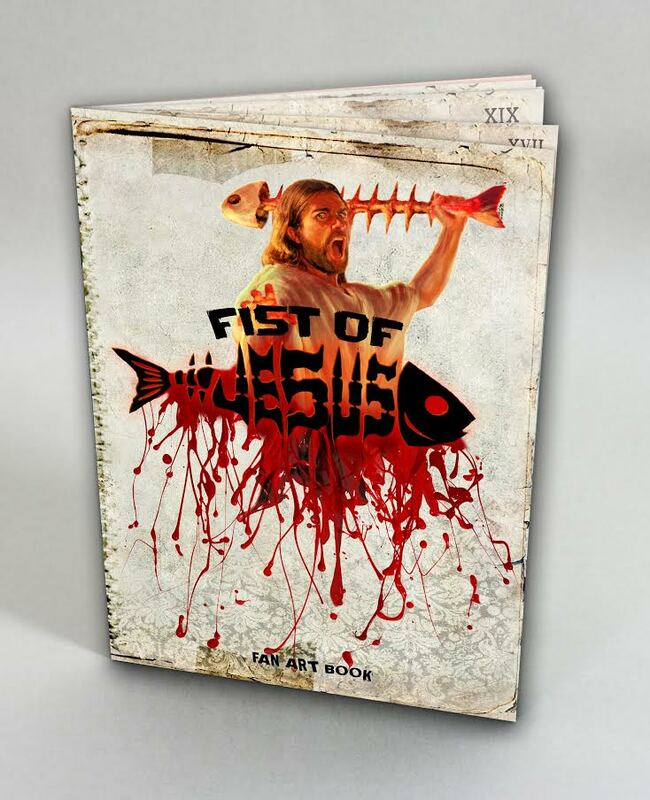 Be the envy of every owner of a car with a Jesus Fish Sticker on it with this AWESOME Logo of Fist of Jesus "Thorns of Fish" Car Sitcker. Se la envidia de todo dueño de coche con pegatinas de Jesús con esta pegatina para coche con la espina de Fist of Jesus. Black t-shirt, Fruit of the loom with Fist Of Jesus design. "Grandes pinceles al servicio de Nuestro Señor"